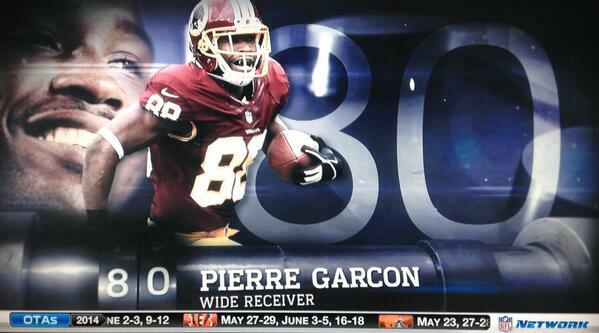 Cast by a vote of his peers, Washington Redskins wide receiver Pierre Garcon was named the 80th best player in the NFL during NFL Network’s Top 100 Players of 2014. His presenters during the piece were teammate Alfred Morris, Philadelphia Eagles cornerback Brandon Boykin and former New York Giants cornerback Terrell Thomas. Garcon’s 113 receptions in 2013 led the NFL and broke Art Monk’s single-season Redskins record. His 1,346 receiving yards last season are good enough for sixth all-time in Redskins history. Garcon’s top performances in 2013 came against the Dallas Cowboys in Week 15 when he caught 11 passes for 144 yards and one touchdown and against the San Diego Chargers in Week 9 when he caught seven passes for 172 yards. “A lot of times he runs the same route over and over and the defense knows it’s coming and he still wins,” Morris added. “He’s almost like a running back when he gets the ball in his hands,” Thomas said. His knack for acrobatic catches and speed after the catch have caught the attention of many throughout the league. A 3-13 season likely led to a lower ranking than expected but being named in the NFL Top 100 by his peers can’t be a bad thing. However, his response on Twitter with an expressionless emoticon seems to show dissatisfaction with where NFL players think he stands among the elite. Where do you think he ranks?